Yes, you can make crispy seasoned baked French fries at home without deep-frying in vegetable oil. Skip the drive thru and precooked frozen packages with chemicals, preservatives, and unhealthy oils. Try making your own hand cut homemade baked fries instead. At one time, I was addicted to the frozen French fries that you can purchase in the grocery store. 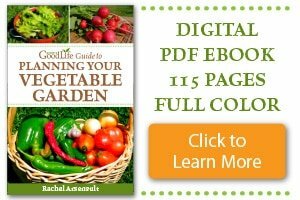 When I began growing food and eliminating processed foods from our diet, the frozen bags of precooked fries were the first to go. I missed them. The first year we grew potatoes in the garden, the crop succeeding beyond our expectations. We had a lot of potatoes piled into our basement root cellar for winter storage. That is when I began experimenting with making baked oven fries to replace the store bought bags. The homemade baked fries were good, but tasted quite bland at first. I experimented with different seasonings to add flavor. One time, I was in a hurry and didn’t have time to mix up various seasonings, so I just used a teaspoon of my homemade taco seasoning. Kevin deemed it the best batch ever. We had a winner! 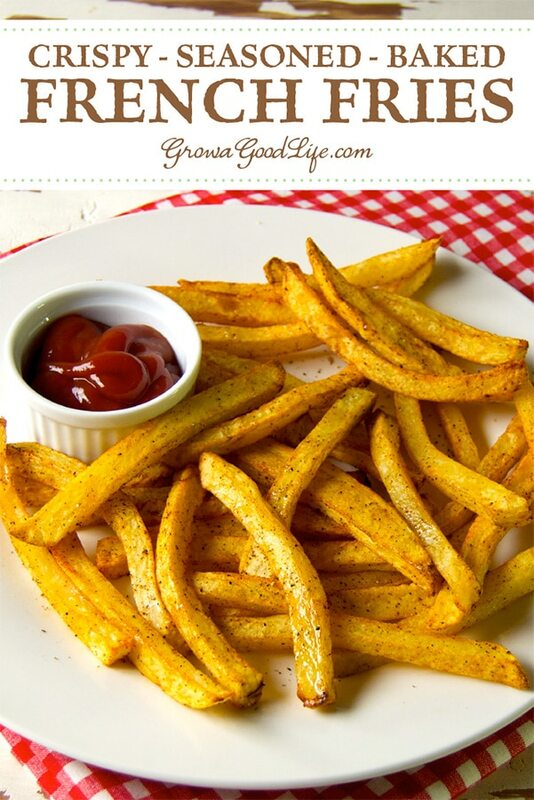 A delicious hand cut seasoned baked French fry recipe using our own homegrown potatoes. A couple of little tweaks later and this recipe is definitely share-worthy. 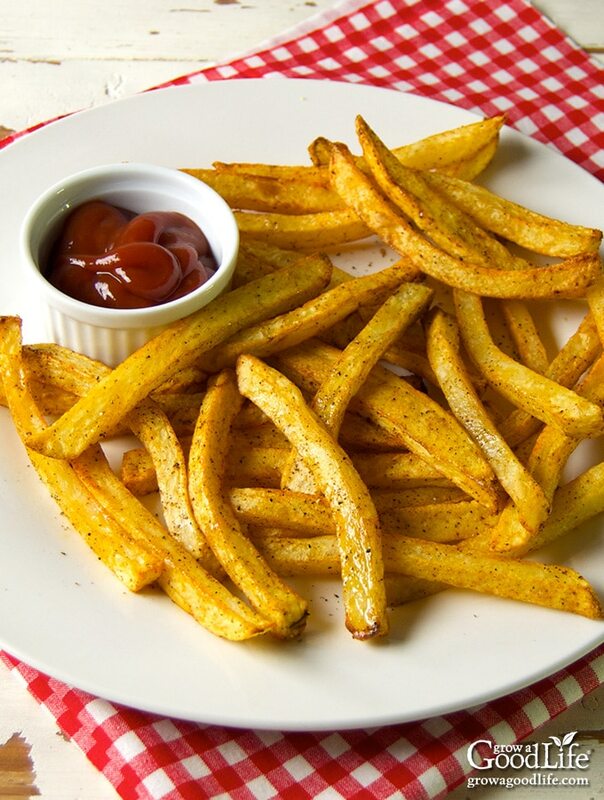 A trick to getting your baked french fries to come out nice and crispy is to soak the cut potatoes in cold water to extract some of the extra starch on the surface. Try to soak at least 15 minutes, but the longer you soak, the crunchier your fries will be. The fries will come out crispy on the outside and soft on the inside. Any type of potato can be used to make baked French fries. However, some potato varieties crisp up better when roasted than others. Choose a high starch potato variety, also known as a baking type potato. The most common baking potato is Russet type. I have found that Katahdin, Kennebec, and Red Norland potatoes will also work well for baked French fries. 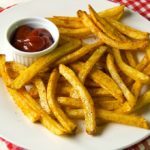 Yes, you can make crispy seasoned baked French fries at home without deep-frying in vegetable oil. 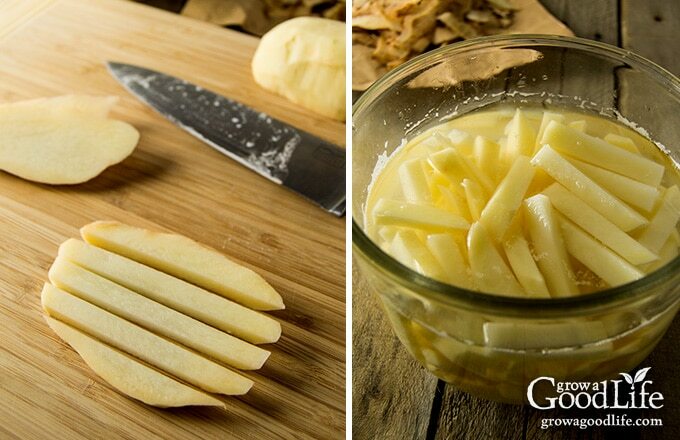 Scrub potatoes, peel if desired, and slice into 1/2-inch strips. Place potatoes into a bowl and cover with cold water. Let the potatoes soak for at least 15 minutes to extract some of the starch. Add the avocado oil, taco seasoning, paprika, and pepper to a large bowl and mix to combine. Set aside. Drain potatoes, rinse, and dry well with a kitchen towel. Add the potatoes to the large bowl and toss to mix with the seasoned oil. Spread the potatoes out in a single layer on two baking sheets. Bake in a preheated oven for 30-40 minutes, until crispy. Turn once during baking so the fries brown evenly. Begin watching them at the 30-minute mark, because some potatoes cook faster than others. Remove from the oven and, add salt to taste, and serve warm with homemade marinara sauce, ketchup, or your favorite dipping sauce. *Click here for the Homemade Taco Seasoning Recipe or substitute 1/2 tbsp chili powder, 1/4 tsp cumin, 1/8 tsp onion powder, 1/8 tsp garlic powder, 1/8 tsp red pepper flakes, 1/8 tsp pepper, and a dash of cayenne pepper. This recipe was originally published on November 12, 2016. It has been updated with new photos and video. I love the soaking tip! Confessing that potatoes are my fave vegetable.. It’s just a fact! I avoid fries whenever possible, as I avoid frying.. BUT.. baked fries have not always been a ’10’.. 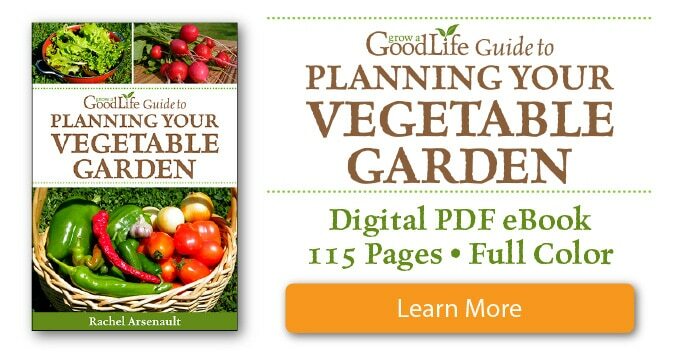 Your tips will certainly help so I am going to add these into the meal plan SOON! I’m going to give these a try tonight. I want to put them in the oven at 400° what would be the length of time? CC, cook them at 425˚F for 30-40 minutes, until crispy. I made these fries for supper.it was a hit..the only thing I didn’t h have was Extra Virgin Olive Oil, so I substituted w/ Crisco oil. I was very surprised at myself. Thank you for the recipe. Wow. These look amazing and crisp even though they are baked. I think I will try these out and then smother them in chili. If you want them crispy on the outside and fluffy inside try twice cooking. For the first time use half the oil and no seasonings and only go for half the time. Take them out and cool completely. I find in the freezer overnight best. Then mix the remaining oil and seasonings and do for the rest of the time. Much more work but a big difference. What I do is have a big batch in the freezer at all times so when I want fries I just make what’s needed. There’s a change in the starch as it cools and gives the different texture the second time. This is why home fries at breakfast made from the previous nights leftover boiled potatoes taste so good. Oh wow, Scott! I am going to try this. I like the idea of having the precooked, seasoned fries in the freezer ready to go. Thank you so much for sharing. I shake the cut and dried potatoes in a plastic bag with the oil and seasonings before baking. Even less oil and perfect every time.